The best way to describe my reaction to Rukeyser’s poetry is to say I got a raging crush on it, the kind of crush only teenagers get. I would turn lines over in my head and try to figure out how the unsettling oddness of the punctuation and spacing worked with the powerful emotions the poem created in me. I started scouring bookstores and libraries for Rukeyser, eventually finding a copy of Out of Silence at a Borders, nestled into the tiny poetry section whose spines I had already memorized. Many of the poems in it were beyond my understanding, though they still captivated me with their unusual music and imagery. It was Kate Daniels’s introduction, though, that brought Rukeyser into my personal history. I was a budding feminist, an aspiring writer, and a semi-out queer girl living in the South, lonely as hell and wondering if there really was a world where I would get to be myself without apology. Here was an openly bisexual woman who lived life entirely on her own terms, even when the political and social costs to her career were staggering. I read Out of Silence until it started to fall apart. It was more than a book: it was proof. I could be a poet; I could be smart and political without being cruel; I could find a community; I could love women as well as men. I could choose my life. My battered copy: dog-eared, note-littered, spine-broken. Of course, not everything worked out exactly as planned — but those things I learned from Rukeyser were all true. 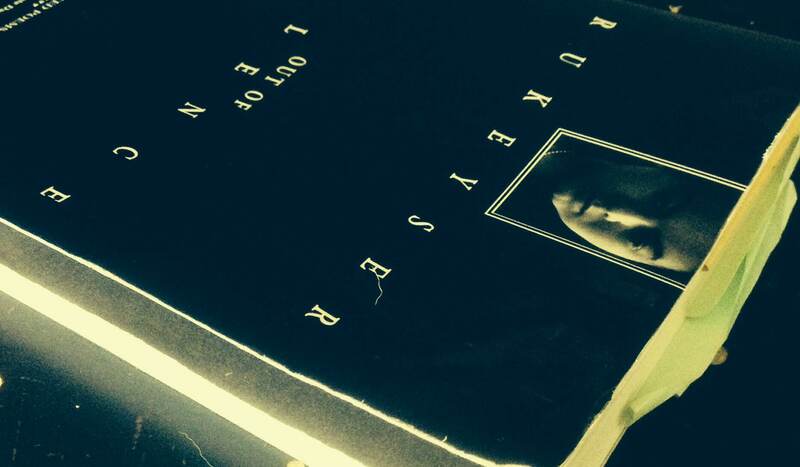 I am a poet; in fact, I’m a professor of literature, and I teach Rukeyser whenever I get the chance. I am an out queer woman; I am part of a lively world of feminist writers online. I took off the masks and mythologies that seemed inevitable when I was a teenage girl, and I became myself. One of my former students, a poet himself, changed his cover photo on Facebook to a black and white photo of Rukeyser. She watched over his digital world. the world of its history leading to this moment. I read Rukeyser for many reasons, but I teach her to answer this call. She’s been an integral part of my personal history for twenty years; I owe it not to her, but to “the present of all I care for” to continue her legacy.